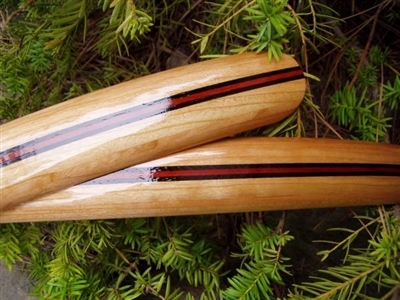 Made from Cherry with a center stripe of red Blood wood flanked by two thin lines of black Wenge wood. These are the real deal! Fully shaped meaning they're cupped on the underside and rounded on the top side. The cupping channels water down the middle of the fender for maximum water protection to keep your toes dry! Fenders come as a set of both front and rear with all mounting hardware. Complete set front and rear with hardware. This is a super cool contrast of wood colors. Made from Cherry with two black stripes of Wenge wood surrounding a center stripe of red Blood Wood. Cherry will darken over time and turn a really nice golden brown color. These get better with time! Comes with stainless steel and brass mount hardware.